The US’ vote against the annual resolution signaled a dramatic shift in Washington’s policy toward the territory, as it used to abstain in previous cases. The administration of Donald Trump had announced its changed policy ahead of the vote. “If this resolution ever made sense, it surely does not today. The resolution is plainly biased against Israel,” outgoing US Ambassador to the UN Nikki Haley said in a statement. During the debate, Syrian envoy Bashar al-Jafari vowed that Damascus would recapture the heights by peace or by war. Tel Aviv has also been pressing the US administration under Israel-friendly President Trump to recognize its claim to sovereignty over the occupied territory in defiance of international law. The resolution on the occupied Syrian Golan was one of the nine separate resolutions which condemned the Israeli regime. Other resolutions included “Palestine refugees’ properties and their revenues”, “Persons displaced as a result of the June 1967 and subsequent hostilities”, “Applicability of the Geneva Convention… to the Occupied Palestinian Territory…”, and “Operations of the United Nations Relief and Works Agency for Palestine Refugees in the Near East”. 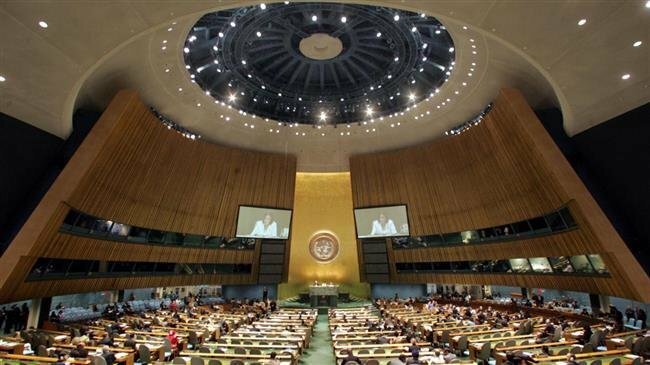 The member states also unanimously voted for a resolution titled “Assistance to Palestine refugees”. Apart from the US, which voted against all the nine resolutions, only a few member states – including Canada and Australia – cast nay votes. The majority of member states voted for the resolutions. Israeli Prime Minister Benjamin Netanyahu today said that he would not back down on his demand that the US recognise Israel’s right to the occupied Golan Heights. “I will not give up our expectation that the United States recognise Israeli sovereignty over Golan,” he said in a statement.